Microorganisms cause mineral precipitation and dissolution and control the distribution of elements in diverse environments at and below the surface of the Earth. Conversely, mineralogical and geochemical factors exert important controls on microbial evolution and the structure of microbial communities. This was the rationale for the Short Course on Geomicrobiology presented by the Mineralogical Society of America on October 18 and 19, 1997, at the Alta Peruvian Lodge in Alta, Utah. Minerals have been known and honored since humans realized their essential contributions to the "terra firma" and stone tools thrust our species on the path of cultural evolution. Microbes are the oldest living creatures, probably inhabiting at least a few salubrious environments on the earth as early as 3.8 billion years ago. At this moment in history we are only beginning to appreciate the intimate juxtaposition and interdependence of minerals and microbes. We have been nudged into this position by the realization that our earth is finite, and the recognition of many global environmental problems that minerals and microbes contribute to, both positively and negatively. In addition, our globe may not be the only site in the solar system where 'life' arose, or may persist. What all of these concerns enunciate is that we as scientists only dimly comprehend our own dynamic "terrestrial halls." This short course and volume have been generated with great enthusiasm for grasping as much as possible of the whole panorama of possibilities that involve both the inorganic and biologic realms . Over 3600 mineral species have been defined and their relationships to each other and the environments in which they form have been documented. This vast data base, collected over the past several hundred years and constantly added to and upgraded, is a monument to the research efforts of many geoscientists focused on the inorganic realm. Much of this data has come from investigators intrigued by the novelty, beauty, and versatility of minerals, direct expressions of the chemistry and physics of geologic processes. We are now adding a new dimension to questions of mineral formation, dissolution, and distribution: what were, are, and will be the contributions of microbes to these basic components of the environment. Microbes have also been known for hundreds of years. However, their small size (0.5 to 5 µm in diameter) and the difficulties associated with identifying a species unless it was grown in the laboratory (cultured), precluded thorough analysis. The advent of molecular biology has only recently made it possible to evaluate microbial evolutionary relatedness (phylogeny) and physiological diversity. These techniques are now being applied to study of microbial populations in natural environments. It is becoming very clear that the surface of Earth is populated by far more species of microbes than there are types of minerals. We are now exploring every portion of the globe and finding the relationships under the rubric "geomicrobiology." The ocean deeps are characterized by a diversity of microorganisms, including those associated with manganese nodules. The profusion and concentration of minerals created at ocean ridges and vents matches the variety of microorganisms, large animals, and plants there. The snowy tops of mountain ranges and glaciers of Antarctica harbor not just ice but whole bacterial communities whose cellular types and activities need elucidation. The equatorial jungles and the deserts, with their enormous diversity of ecological niches, further challenge us. The diversity of geographic, geologic, and biologic environments, including some contributed by humans (e.g. mines, air-conditioning equipment), can now also be explored in detail. Modern studies use protocols developed to preserve or measure in situ chemical and physical characteristics. Electron microscopes allow direct characterization of mineral and biological morphology and internal structures. Spectroscopic techniques permit complimentary chemical analysis, including determination of oxidation states, with very high spatial resolution. Other studies quantitatively measure isotopic abudances. These data serve to distinguish biologically mediated, or biologically controlled formation of the mineral from an abiotic process and mechanism. Each ecological niche requires accurate characterization of the mineralogic and biologic entities in order for us to begin to understand the range of dynamic relationships. We can pose many questions. Is the mineral only a substrate, or is its occurrence and stability impacted by microbiologic activity and metabolic requirements? Which minerals are of microbiological rather than inorganic origin and what are the mechanisms by which organisms dictate the morphology and structure of the solid phase formed? How do organic metabolic products bind metals and change their form and distribution, with implications for metal toxicity and geochemical cycles? How do inorganic reactions such as mineral dissolution and precipitation impact microbial populations through control of their physical and chemical environments? Clearly, new and excitingly research areas exist for all varieties of scientists. 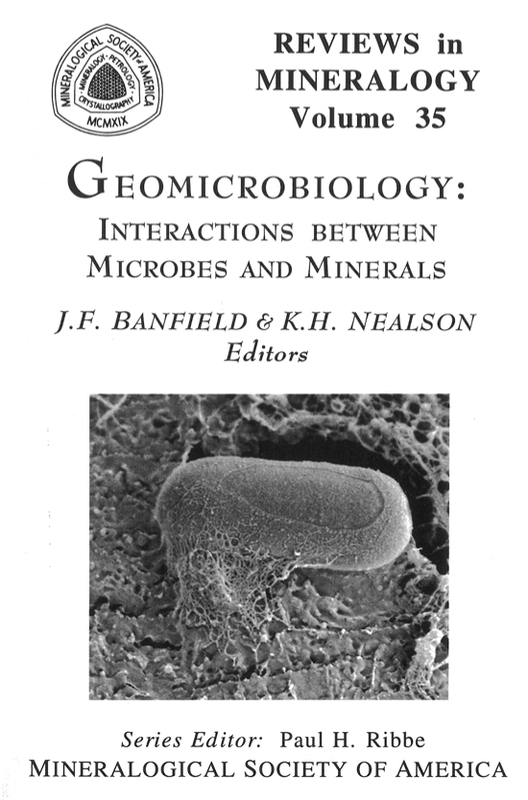 Although published by the Mineralogical Society of America, the authors of this volume include microbiologists, molecular biologists, biochemists, biophysicists, bioengineers as well as biomineralogists. Here, they bring together their respective expertise and perspectives to provide disciplinary and interdisciplinary background needed to define and further explore the topic of geomicrobiology. Nealson and Stahl acquaint us with the basic properties of prokaryotes, including their size and structure. They define the types and ranges of microorganisms and their metabolisms and describe their impacts on some important biogeochemical cycles. Barns and Nierzwicki-Bauer document the phylogenetic relationships and evolution of microorganisms, begging some fundamental questions that might be now just beyond our grasp: What was the 'last common ancestor'? The physiology, biochemistry and ecology of hyperthermophilic, and the many diverse geologically important microbial species from the lithosphere and hydrosphere, as well as some of the techniques employed, are presented. Banfield and Hamers describe and integrate the processes acting on minerals and at surfaces relevant to microorganisms, examining the factors that control mineralogy, mineral forms, and the stability of phases. Surface properties and reaction rates for dissolution, precipitation, and growth of important classes of minerals are discussed. The possible role of mineral surfaces in formation of prebiotic molecules needed to explain the origin of life is examined. Little, Wagner and Lewandowski describe biofilms, an essential interface between microbes and minerals. They demonstrate that these membranes, with their unique morphological and structural attributes, are sites where much activity related to dissolution and/or formation of minerals takes place. Biology makes it possible to move molecules and elements against a gradient. Many questions regarding the transfer of elements from minerals to microbes at this important heterogeneous interface remain. Fortin, Ferris and Beveridge review surface-mediated mineral development by bacteria. Fresh or oceanic waters, anaerobic or aerobic environments provide discretely different ecologies, bacterial entities, and resulting mineralogies. It is obvious from this presentation that investigators have just scratched the surface of microbial mineralization processes. Bazlinski and Moskowitz review the magnetic biominerals and provide insights into the environmental and biological significance of these few tens of nanometer-sized mineral products. The magnetosome chemistry and biochemistry is probably the best understood of any biologically precipitated mineral. Their formation and unique properties underscore the roles these biomaterials play in the rock magnetic record and in geochemical cycles. Tebo, Ghiorse, van Waasbergen, Siering and Caspi contribute data on the roles of Mnminerals and Mn(II) oxidation in geologic environments. Their chapter encompasses molecular genetic and biochemical investigations. Manganese oxides and oxyhydroxides are notoriously difficult to identify and the crystal chemistry of these phases is a research effort on its own. The prospect of learning how microbes utilize the multiple oxidation states of Mn (2+, 3+ and 4+) as a source of energy sharpens the motivation for interdisciplinary study. Manganese is also known as a cofactor in the production and activation of the enzymes that digest large biomolecules that must be the source of the smaller molecular species and ultimately the building blocks of C, N, 0, H required by all species. How have the mechanisms identified in the bacterial systems been transferred up the phylogenetic tree to plants and humans? This is an expanding and intriguing area for further investigation. DeVrind-de Jong and de Vrind address silicate and carbonate deposition by algae (eukaryotic photosynthetic microorganisms). This chapter documents the mechanisms of biomineralization of diatoms and coccoliths. These abundant aquatic organisms are responsible for huge volumes of siliceous sediments and calcium carbonate deposits world wide. The implications of algal biomineralization for climatic variation throughout much of the Earth's history may be quite significant. Stone leads us though a quantitative approach to evaluating reactions between organic molecules and cations. He considers available extracellular organic ligands and the roles these play in uptake of metals. He documents the basic chemical speciation and complexation for several elements, making metal to metal comparisons. Remaining challenges involve coordinating the organic and inorganic results of biologic activity. Following the discussion of biomineralization and interactions between organic compounds and cations, Silver discusses the strategies microorganisms have evolved to deal with toxic metal concentrations in solution. Beyond the fundamental biological significance, this has important implications for understanding microbial populations in contaminated environments. The impact on the geochemical form (speciation) and distribution of elements is also discussed. 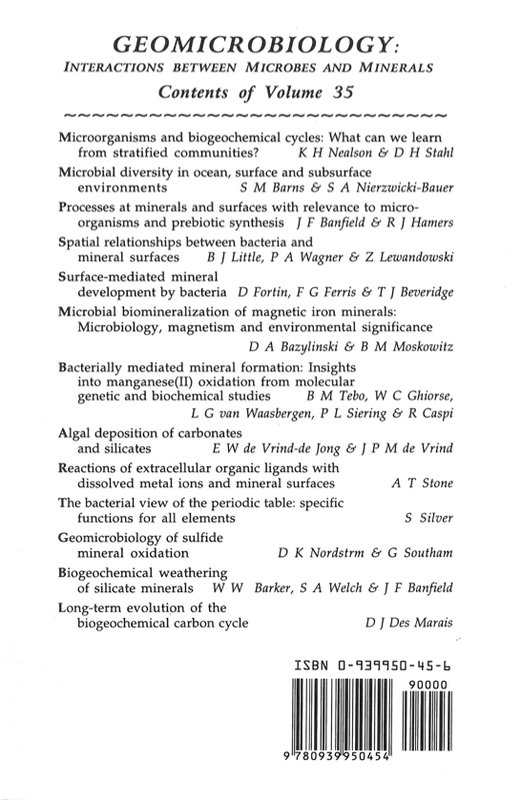 Nordstrom and Southam summarize sulfide mineral oxidation and dissolution kinetics and devote considerable effort to describing the specific contributions of microorganisms, mostly bacteria. Despite the vast amount of accumulated information, many unanswered questions remain. Barker, Welch and Banfield address weathering of silicate minerals. This topic encompasses not only mineralogy but geomorphology, microbiology, and geochemistry. The necessary interdisciplinary mode of these investigations is highlighted by discussion of the role(s) of bacterial nutrition, groundwater chemistry, and biochemistry. There are obvious implications for hazardous waste storage, a currently daunting and politicized topic that requires predictions over thousands to millions of years. Finally, Des Marais treats the long term evolution of the carbon cycle, adopting a biogeochemical view. He discusses the sources, sinks and the transfer of the element over geologic time. Consideration of such a basic series of questions relating to the partitioning of carbon necessitate interdisciplinary crossovers. It is a fitting conclusion to a dialogue in progress. 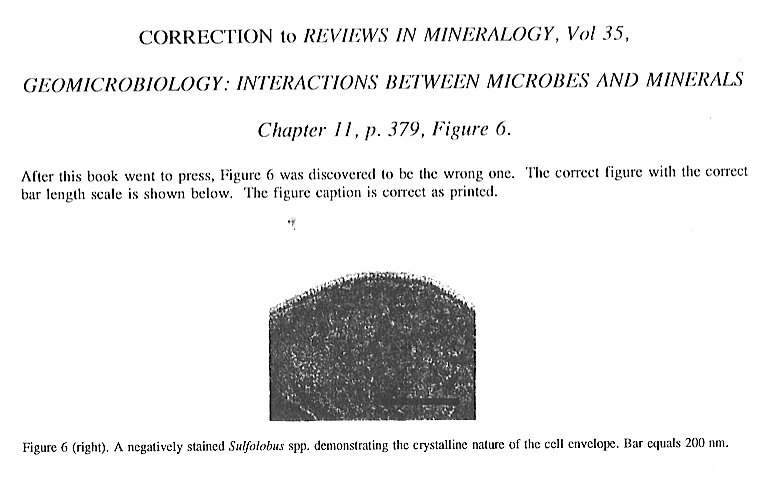 After this book went to press, Chapter 11, Figure 6 was discovered to be the wrong one. The correct figure with the correct bar length scale is shown here. The figure caption is correct as printed.